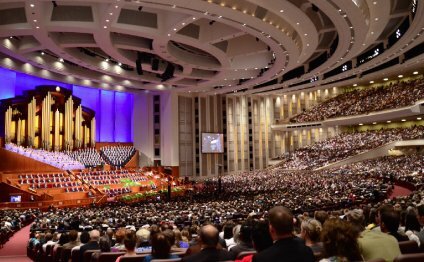 For more than eight decades, nearly the lifetime of radio, the Mormon Tabernacle Choir has presented a weekly program — Music and the Spoken Word — without interruption, giving voice to peace, hope, inspiration and the goodness of God. No other broadcast can claim such a heritage. The first airing on July 15, 1929, was makeshift at best. That summer day, a local radio crew ran a wire from their control room to an amplifier in the Tabernacle nearly a block away. The technicians suspended the station’s sole microphone from the domed ceiling not only to capture the music of the Choir but also so an announcer could introduce each number. Nineteen-year-old Ted Kimball—son of the Tabernacle organist and the designated announcer—perched on a ladder for the duration of the program so that those listening could hear his words. Since the program’s singular beginning and through years of remarkable change in broadcasting, the Choir has held its place providing music and inspiration for everyday living. Special programs commemorate holidays –Christmas and Easter-and singular events such as 9-11, Martin Luther King Day and July 4.